Drug company Eli Lilly aims to expand across China amid a rise of chronic illnesses that would propel sales of the pharmaceutical giant's diabetes, cancer and cardiac drugs, its chairman and chief executive said. But the Indianapolis-based company, along with other industry competitors, faces an uphill challenge in the world's second largest economy, said John Lechleiter in an interview. Mr. Lechleiter, who declined to disclose any specific benchmark goals or plans for expansion in China, said obstacles to growth include slow regulatory approvals for clinical trials, even slower clearance for drug approvals and inefficient protection of intellectual-property rights. Many drug makers have looked to China as a market with high growth potential and one that could help offset sluggish sales from patent expirations. More than 260 million of the country's citizens suffer from a chronic disease, according to data from China's Ministry of Health. And after a three-year, $125 billion health-care overhaul, insurance coverage has been expanded to 95% of the population, creating more access to health care. The growth is already evident. For drug makers such as such as Bayer HealthCare and Novo Nordisk China ranks among their top three markets by revenue contribution. Other companies expect China to become a larger part of their business, as China's health-care spending is poised to triple to $1 trillion by 2020, according to consulting firm McKinsey & Co.
Lilly executives, building their diabetes business in the market, have said revenue from China jumped 31% in 2011. The company doesn't break out financial data by country. Yet challenges exist. Mr. Lechleiter said data protection is a major concern for Lilly, as the company's products are often copied before regulators check to see whether drug patents have expired. "We've seen a lot of progress made in the last three years in China, but more needs to be made if China is to move to build a truly innovative biotechnology industry," said Mr. Lechleiter. Getting new drugs to market in China is a battle, as drug approval takes eight years on average in the country, said Mr. Lechleiter, adding that China's State Food and Drug Administration lacks adequate manpower to manage requests. Lilly aims to develop drugs for the Chinese, to help treat diseases prevalent in the country, but regulatory approval for clinical trials takes 12 to 18 months, compared with several weeks in the U.S., Mr. Lechleiter said. Still, the number of clinical trials Lilly has conducted in China has increased to 16 in 2012, up from nine a year earlier. In 2013, the company plans to have 32. Studies have or will include trials for insulin products and Lilly's erectile dysfunction drug Cialis, the company said. Chinese health officials are aware of problems in the overall health-care industry, which go far beyond the pharmaceutical market. Many have called for hospital reform, as urban public hospitals are flooded by patients coming from the countryside in hopes of better care than what can be provided in lagging facilities back home. 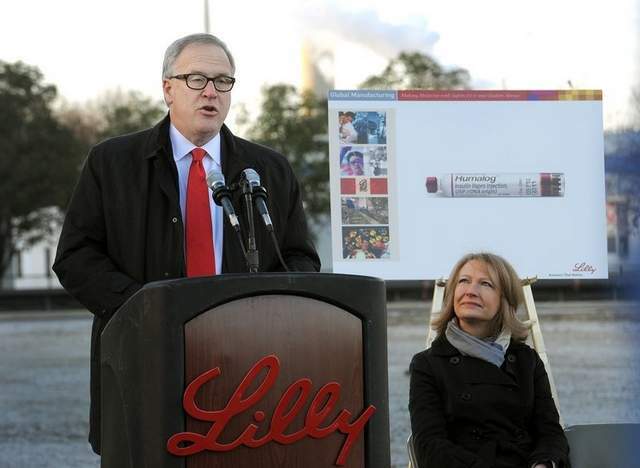 Despite market problems, Mr. Lechleiter and other Lilly executives remain hopeful. "This will soon be the second-largest pharmaceutical market in the world, 95% of the population has basic health-insurance coverage and chronic disease here mirrors developed countries," said Mr. Lechleiter, adding, "There is no other place in the world like China." Lilly is aiming to increase its market share in pharmaceutical sales, which currently stands at 0.7%, with an estimate of $300 million in sales in the first half of this year, up nearly 17% from the same period a year earlier, according to IMS Health, which tracks drug sales. Increasing sales would mean branching beyond China's biggest cities and into the hinterland, where hospitals and clinics are expanding, but where doctors require additional education, said Eric Baclet, president and general manager of Lilly China. Building volume is critical for all drug makers in China, which have faced pressure as the government-enforced price restrictions in recent years have increasingly squeezed pharmaceutical companies' profits. Leaders established in 2009 a so-called essential drugs list to phase out premium pricing and offer subsidies on 307 types of drugs. Messrs. Baclet and Lechleiter didn't address goals for getting Lilly's drugs on the government list. "The challenge now is to figure out how to cast the net more broadly and to do it efficiently and effectively," Mr. Baclet said.